THE CUTTER - This razor sharp aquatic weed cutter cuts a 4 ft wide path with each pass. Includes two 2ft extensions, a 25ft leash & blade sharpener. Other cutting tools such as the Serrated Lake Weed Cutter, T-Weeder or the Weed Razer work okay but many say that nothing compares to the Weedshear. THE RAKE - THE RAKE - Heavy duty lake weed rake has a 5.5ft handle and a 3ft wide head with slightly outward angled teeth ideal for close range raking. THE FORK - Ultra-lightweight aquatic weed pitch fork with a sturdy 16" x 12" reinforced rounded basket. Ideal for picking up piles of lake weeds along your beach. The pitch fork comfortably holds up to 30lbs of seaweed. Designed for less strain on your back. 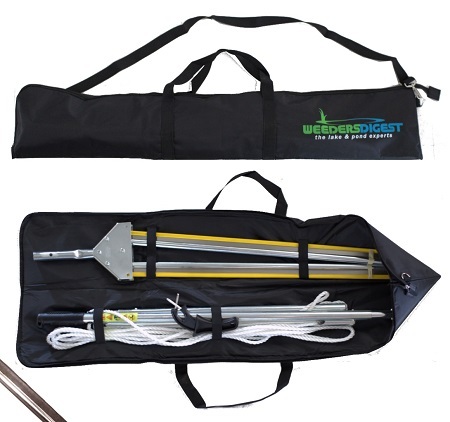 These three tools make for the ultimate shoreline, beach & seaweed management package out there! WE ALSO OFFER A SIMILAR PACKAGE WITH RakeZilla Big Tine Rake - CHECK IT OUT HERE!